A new guide to help Peterborough pub-goers find their perfect pint at an ideal watering hole has been made available across the city. The Peterborough Real Ale Pub Guide will be found in pubs, libraries and attractions around the city to celebrate the variety of local pubs available to beer drinkers. The free guide - listing 40 pubs from the Apple Cart to the Wortley Almshouses - is the brainchild of Mike Blakesley, from the Peterborough branch of Camra. He said: “We did a Real Ale Guide for Peterborough 20 years ago, but so many pubs have closed or changed hands we had to update it. “There are 40 pubs in the guide who regularly serve real ale. “The guide explains a bit about the pub, as well as the nearest bus stop and what route it is on, and other details like opening hours. The 40 pubs included in the guide range from chain pubs like Weatherspoons, to small independent pubs in the city. Mike said: “Peterborough has a good selection of pubs available, and we want people to keep visiting them. 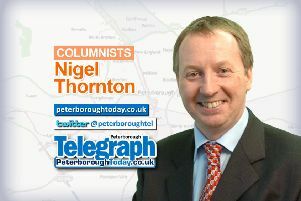 “The guide only includes pubs in Peterborough, not in surrounding areas like Whittlesey. “We got the idea to publish the updated guide after visiting the Colchester Beer festival, which already has something similar. “It has taken six or seven months to get everything together, and to verify with landlords all our information was correct. “We are looking at doing other guides as well - possibly a cider pub guide, for example. “It is important people do visit their local pubs to keep them alive. The guide will be available in all 40 pubs that are included, as well as at the tourist information office, libraries and Peterborough Museum by the weekend. An electronic version will also be available by visiting www.peterborough-camra.org.uk. As part of the guide launch I took myself on a mini-pub crawl sampling some of the beers on offer in the city centre. My first stop was the Drapers Arms in Cowgate. The busy Weatherspoons has a wide variety of ales on sale, and I tried Astral, from the Star Brewing Company. Whilst I got the last pint of the barrel, it was a nice, light beer. My next stop was the ever popular Charters - and even for a Sunday afternoon it was busy. I selected Citra from Oakham Ales, which provided a refreshing taste for the second half of the England match. My final stop was the Palmerston Arms on Oundle Road - my local for the last six years, and settled for the Harvest Pale. But my tipple of choice failed to help efforts in the busy pub quiz.